A choice of procedures to renew, refresh and revitalize your face and body without surgery. Imagine a more beautiful you! BOTOX, our most popular non surgical injection, is a purified biological protein for the treatment of forehead lines, lines around the eyes (crow’s feet), upper lip lines, and corners of the mouth. It is administered via tiny injections directly into overactive muscles that cause lines to form. How does Botox affect wrinkles? Certain wrinkles are created when nerve cells within the skin's muscles release a chemical called acetylcholine. 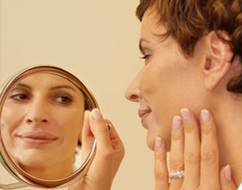 Acetylcholine, in turn, triggers muscle contractions that create wrinkles. Botox blocks the release of acetylcholine, which paralyzes the muscle, stopping the contraction and erasing the wrinkle. The effects of Botox generally appear in 1-3 days and are fully evident within one week, its effects generally last 4-6 months. Published literature now shows that patients who maintain a schedule of treatments over time may permanently reduce the severity and onset of facial wrinkles. The effects of BOTOX are localized to the injected area; it does not travel throughout the body. Side effects are rare and generally limited to mild bruising. Over many years of use and millions of patients across the globe, Botox has proven itself safe and effective, with minimum side effects. The American Society for Aesthetic Plastic Surgery ranked BOTOX Cosmetic as the most popular physician-administered aesthetic procedure in the United States for the fourth year in a row (surgical and non surgical combined). Indeed, we currently have no other medical or surgical treatment capable of predictably emulating the effect of the botulinum protein on deeper motion wrinkles. BOTOX injections are also effective for Hyperhidrosis (excess sweating) of the underarms and palms. Restylane is a filler containing hyaluronic acid which, like collagen, is a natural component of the skin. It is a non-animal, biodegradable product that is produced under laboratory conditions. Skin tests aren’t required prior to treatment. What is especially appealing about this substance is that it has been reported to last 6 to 9 months. Restylane may be used to correct facial wrinkles and to add fullness to the lips. Results are fully evident within one week. More than one million treatments have been performed worldwide.